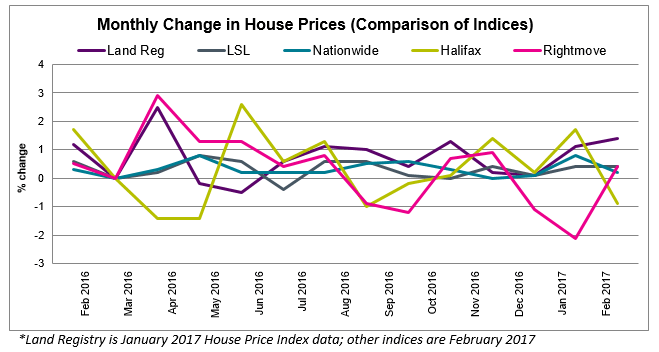 Most of the major House Price Indices report house prices to be up in the past month: 0.1% Halifax, 0.6% Nationwide, 0.6% LSL, 0.8% Land Registry. 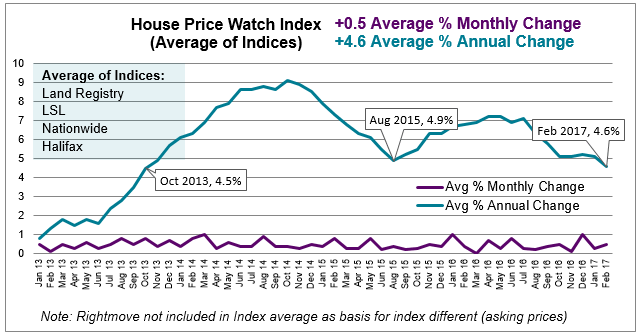 Rightmove, report a rise of 2.0% in asking prices in February. Land Registry data refers to January. All other indices are reporting February figures. UK home sales decreased by 0.7% between January 2017 and February 2017; 1.9% lower compared with the same month last year. (HMRC seasonally adjusted figures). However mortgage approvals for house purchases, a leading indicator of completed house sales, increased to their highest level since February last year. Approvals are up 2.4% between December 2016 and January 2017 from 68,266 to 69,928 (Bank of England). RICS residential market survey indicates new buyer enquiries are steady. New sales instructions are down in February leaving the stock of homes available for sale near record-lows. 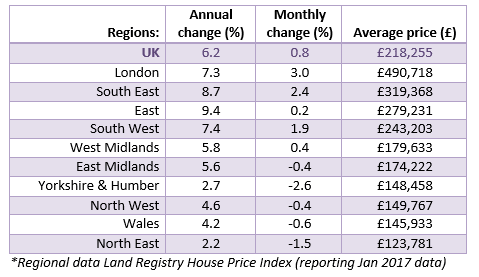 Regionally, house prices are up in the past month (January data) in London, South East and East of England and West Midlands. 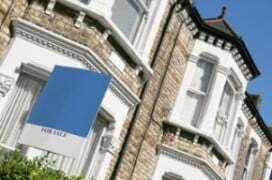 House prices are down in the East Midlands, the North of England and Wales.